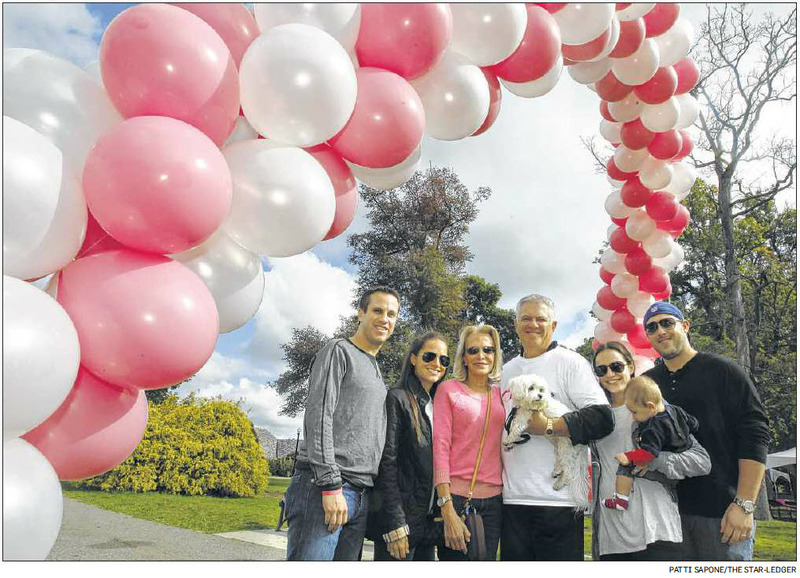 The Abramson family — son-in-law David Symons, daughter Heather Symons, parents Lisa and Andrew Abramson, daughter Lauren Mirman, with 8-month-old son Ryan and husband Matthew — attended Sunday’s Salons for the Cure walkathon at Verona Park in Verona. The event was held to raise funds for the Cure Breast Cancer Foundation, a charity organized by the family to support researchers at Memorial Sloan-Kettering Cancer Center in New York. Lisa Abramson is a breast cancer survivor. Here’s how an experienced businessman runs a breast cancer charity: He incorporates, rustles up a board of trustees, holds a golf tournament and strong-arms his business buddies into writing really big checks. He gives all the grant money to one doctor at Sloan-Kettering. Then he gets out of the way. That’s the simple premise of the Clifton-based Cure Breast Cancer Foundation, founded by Andrew Abramson’s family in the wake of wife Lisa’s first brush with breast cancer. Now, in the nearly two years since the Susan G. Komen for the Cure charity rocked the world of disease-prevention charities with a controversy about abortion, donors have become more inquisitive about where their money goes. The CBCF has an easy answer: It goes to Larry Norton, deputy physician-in-chief for breast cancer programs at Memorial Sloan-Kettering Cancer Center, New York. And what does Norton do with the half-million dollar annual donation? Another easy answer: Whatever he wants to. That no-strings-attached approach allows Norton and his colleagues to pursue theories that are too new to gain institutional or pharmaceutical funding. It also allows him to use money more efficiently, Abramson said. When a researcher with a government grant starts to sense his line of inquiry might be unfruitful, he has only two choices: Continue the research to its pointless conclusion, or stop the study and return some of the money. By contrast, the CBCF donation gives researchers flexibility: They can switch gears whenever it seems warranted. “We said, ‘If all of the sudden, you’re going down one road and you see something interesting off to the left or right, do it! Take the turn!’ ” Abramson said. Twenty years ago, there was enough research money from the federal government to fund the earliest part of any project: the “idea” stage, when theories are being proposed, Norton said. Those days are gone — making it vital that groups such as the CBCF do what they can to fill the void. The approach of giving all a charity’s largesse to a single researcher is unusual, said Sandra Miniutti, of Charity Navigator, the Glen Rockbased advisers to nonprofit groups. “But so long as they’re being completely transparent, I don’t think it’s an issue,” she said. Charities — particularly those related to diseases — can get in trouble when they are vague about where the money goes. The Abramson charity is quite clear about its support of Norton. Its website describes the theory of cancer cell “self-seeding” he’s exploring and he attends the annual golf tournament dinner to give donors a jargon-free progress report. And what if Norton’s research turns out to be a dead end? 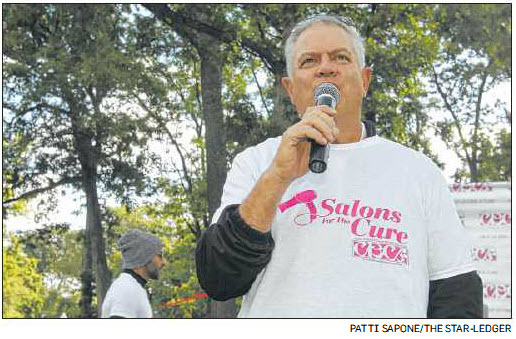 Andrew Abramson addresses the crowd during Sunday’s event, which raised funds for the Cure Breast Cancer Foundation — the Clifton-based charity that his family founded. The CBCF began very much as a family affair. Abramson, 59, had known Norton nearly 30 years, from their days together on an American endowment advisory board for cancer researchers at Hebrew University. When Norton learned Lisa Abramson had a family history of cancer, he recommended she receive more vigilant checkups. Sure enough, a routine checkup revealed a lump in 2004, when she was 49. Norton treated her; she had surgery, chemotherapy and radiation. Daughter Carly was 12 when her mother was diagnosed. She made a stylish beaded key chain to cheer up her mother, who then showed it off at Sloan-Kettering, where it enthralled the nurses. Eventually, Carly began selling them for $15 — and what started out as a coping mechanism ended up generating a $10.000 donation to Norton. But the North Caldwell family didn’t want to stop there. Nor did they want to limit themselves to $15 bracelets. Their first golf outing raised $800,000, with most of the guests coming from Abramson’s extensive circle of acquaintances in the world of residential and commercial real estate. His Clifton-based company, Value Companies, Inc., is a real estate development, investment and management firm. For the past four years, the charity has operated “Lease for a Cure,” an innovative way to tap into the generosity of major apartment building owners in the state. The owners are asked to donate $10 for every lease renewal and $20 for every new lease signed in October. The program, so far, has raised more than $65,000, said Heather Symons, another Abramson daughter who volunteers with CBCF. This year, it’s being expanded to include tenants of Value’s more than 3,000 residential units in New Jersey, New York and Pennsylvania. Participants in “Residents for a Cure” can add extra money to their October rent check, and Value will match all contributions up to $2,500. Since the charity was formed, Lisa Abramson has been treated for two more new, unrelated breast cancer tumors, in 2008 and again in 2011. Having achieved a level of success and stability, they’re now looking to expand and ensure the charity’s future. Abramson said Norton, now 66, has already designated a young colleague to continue his liaison with the foundation, so the line of succession, so to speak, is set. And his daughters are working on creating a junior board of trustees, so the foundation reaches younger people.